Holders FC Barcelona has been knocked out off the Champiosn League by a reselient Chelsea side despite being down to ten man for the majority of the match. A momentary lapse in concentration which lead to the Ramires goal and a missed penalty by Messi in the second half killed Barcalona's comeback hopes. Busquets brought Barca back in the tie when he opened the scoring, Iniesta then looked like have sealed the match but in the first half injury time we conceded again as in the first leg. Torres made sure of Chelsea's progress when he scored deep into the second half injury time, but by that time we had already lost hopes.Chelsea went with an unchanged line-up from the first leg. GUardiola elected for a 3-4-3 diamond formation for this crucial tie. The three men defense had Puyol, Pique and Mascherano. The midfield had BUsquets, Xavi, Iniesta and Cesc. Cuenca, Messi and Sanchez formed the front trio. Real Madrid well and truly have sealed the La Liga title of 2011-12 season with a 2-1 victory at the Camp Nou. Khedira and Ronaldo scored for the away side taking them 7 points clear of the defending Champions. It was the first victory of Real Madrid under Mourinho against FC Barcelona in the league, incidently it was the first victory for Mourinho at the Camp Nou. What a time for that to happen. A first half goal from Khedira put Real Madrid in the pole position but Sanchez equalised within a minute of his introduction but within two minutes Ronaldo put Madrid back in front. And we failed to respond to such a set back. Guardiola went once again went with the same defense which lined up against Chelsea - Alves, Mascherano, Puyol and Adriano. The midfield had Xavi, Busquets and Thiago. Once again Iniesta was used in the flanks along with Tello and Messi in the middle. Real Madrid meanwhile wnet with Casillas, Arbeloa, Pepe, Ramos, Coentrao, Alonso, Khedira, Ronaldo, Ozil, Di Maria and Benzema. A brilliant counter attacking goal at the very end of the first half is standing strong between Barcelona and the Champions League final in Munich after Chelsea secured a 1-0 victory at Stamford Bridge tonight. It was kind of a harsh and unlucky night with players wasting gilt edged chances, hitting the post on a couple of occasion and on all other occasion the Chelsea defense standing strong. For Chelsea this would feel like a revnge for the exit at Barca in 2009, but for Barca we still have a chance to go through provided we lift our games at Camp Nou next Tuesday. It was that kind of a day where you see Cesc Fabregas missing two chances, Sanchez another and hitting the bar once and on the very end of the night we struck the post from a Pedro shot. Guardiola srarted with Puyol and Mascherano in the centre of defense with Alves and Adriano playing the full back roles respectively. The rest of the line-up was as expected. Xavi, Iniesta and Busquets fromed the midfield. Sanchez, Messi and Cesc Fabregas formed the attacking trio. It's been three years since Barca has last met Chelsea in the Champions League. On that rather controversial night, FC Barcelona secured their first Champions League final birth under Guardiola courtesy of a sensational strike from Andres Iniesta, the Ghost face in the very dying moments of the match. Since then we have made three semi-finals, winning lst season, losing out to Inter in the season before and getting ready to face Chelsea tomorrow this season. But inspite of all these success, it is fair to say that the ghost of Stamford Bridge has always cast a shadow on this wonderful team's achievements; atleast from the perspective of people who does not like Barca and their style of play. Mourinho definitely tops that list and he reiterated that with a rather spooky comments following his team's exit at the hand of the Blaugrana. So it is natural to see both set of fans building this Semi-Final tie as the ultimate oppurtunity to rectify the injustice done to them . chelsea fans and players wants revenge for that night's event at Stamford Bridge, meanwhile Barca fans definitely want to end the unfair criticism laid out by English football fans on their team in some grand style. So with such back drops, this could prove to be much more than a simple Champions league final. FC Barcelona has cut the lead at the top to a mere one point following their victory against Getafe at Camp Nou tonight. Two goals from Sanchez, one each from Messi and Pedro gave Barca a deserving 4-0 victory, more importantly all the three points. It was a totally dominating performance and the 4-0 scoreline was a bit of understatement for the chances we created. It was a sweet revenge for Barca players and fans as Getafe was one of the two team who had defeated Barca in La Liga this season. The club had confirmed earlier that Abidal's liver transplatation operation has already started and is expected to last eight hours. Guardiola went in with a three man defense - Puyol, Mascherano and Adriano. Busquets, Iniesta, Xavi and Messi formed the midfield. Pedro, Sanchez and Cuenca formed the attacking trio. The line up was a bit strange as we had four attackers in the starting line-up. FC Barcelona closed the lead at the top of the League to three points with a brilliant 4-1 victory against real zaragoza away from home. Once again, as it's been the trend in recent away matches - we were made to play in another potato pitch. But it didn't matter as we won convincingly by scoring 4 goals. It was pretty eventful with Aranda missing a penalty in the first half, then giving them the lead. But our boys showed the character with Puyol equalising and Messi putting us ahead in the fist half itself. 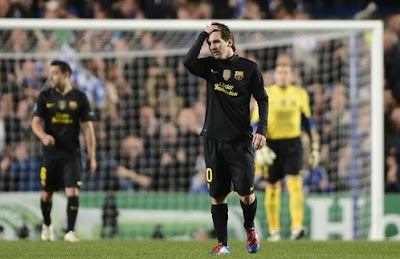 Messi then scored from a spot kick and Pedro then finished off the match in the injury time with a well taken goal. Guardiola starte both Iniesta and Xavi from the bench. 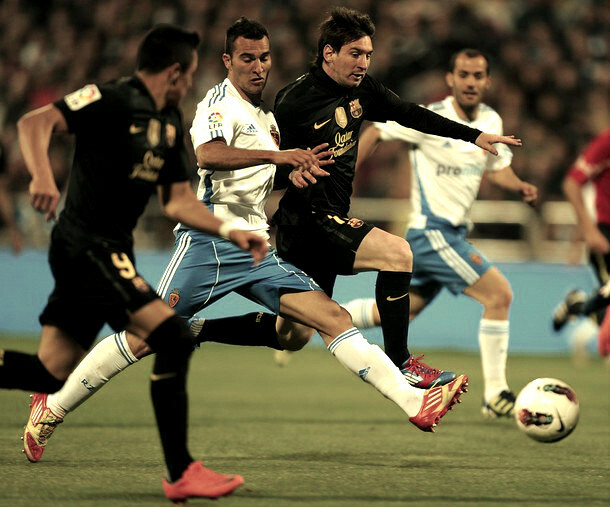 Sanchez came back to the starting line-up after and formed the attacking trio with Pedro and Messi. The midfield had Keita, Thiago and Fabregas. The defense which was really stretched following Pique being ruled out had all available members lining up - Adriano, Puyol, Mascherano and Alves. When the draw was made last month in Lyon, everyone expected a Barca vs Chelsea match up in the semi-final. Now with both the teams winning their respective Quarter Final ties, that expectation has turned into reality. In normal circumstances players try to underplay past issues, results and other facts into the build up to one of the most important matches of the season. But it looks like the wounds of that dramatic night at Stamford Bridge which was turned on it's head by a Iniesta screamer is yet to be healed for many Chelsea players. I have always maintained that we were pretty lucky to have not conceded atleast two penalties that night. I have heard many of fellow cules arguing that Henry should have had a penalty in the first leg. There is some merit in the argument but as the saying goes "Two wrongs don't make a right", that argument can only be used for the sense of arguing. Chelsea were hard done by refereeing decisions that night and it is normal that their fans and players still feel the disappointment. There is no better statement to express that disappointment than Lampard's commenst after booking the semi-final birth - "Everyone's got unfinished business with Barcelona,They're the greatest team in the world. They have been and still are. But that game is still in our minds, but this is a different year and we have to try to beat them. They'll be favourites but we've got belief. We know we'll have to perform to our best to beat them, but we believe we can do it." FC Barcelona maintained their pressure on La Liga leaders with a brilliant 2-0 victory at home against Atletic Bilbao. Iniesta opened the scoring in the first half and Messi secured the three points when he calmy finished off a penalty in the second half.With Real Madrid winning at Osasuna, we were nine points away from League Leaders. So anything less than a win was not good for Guardiola's boys. Guardiola once again started Xavi keeping the Milan clash in mind. The midfield had BUsquets, Thiago and Iniesta. The front three were made up of Tello, Sanchez and Messi. The back four had Alves, Mascherano, Pique and Puyol. Atletic started Muniain and Llorente off the bench.